For many of us, the Civil War is something we learn about during a two-week overview in an eleventh-grade history class. That’s it. Two weeks. But it was enough for many of us to learn the basics about the conflict. The South wanted to break away, in part to be able to continue to own people. The North wasn’t having it, and the two sides fought immensely bloody battles. Spoiler alert, the North won. Well, for most of us, the North won. Some people are still pro-Confederacy, to varying degrees. In August 2017, Charlottesville, Virginia, saw horrifying violence perpetrated by tiki torch-wielding people who were concerned about statues commemorating Confederate soldiers not getting enough respect. In September, and later in December, of that same year, similarly pro-Confederate statue protesters descended on Richmond, Virginia, the onetime capital of the Confederate States of America and current hipster hub. No violence erupted in the Richmond “rallies,” both of which took place in a part of the city called the Fan, populated by both families and students who attend nearby Virginia Commonwealth University. Perhaps people on both sides were scared of having a second Charlottesville. I know I was. I hung out that September afternoon in a friend’s apartment about a block away from the rally’s location ready to offer first aid to anyone who might need it. Luckily, my admittedly limited medical skills weren’t necessary. I didn’t bother getting my first aid kit out and heading to the Fan. My gut said to not worry and, luckily, my gut was right. Even if I don’t agree with someone’s politics, I don’t want someone to be hurt. I used to think that this sort of philosophy wasn’t abnormal. These days, I’m not so sure. And all of this has roots in a longer legacy of Confederate ambivalence in Richmond. This is not the first time that Richmond has had to wrestle with its Confederate past. There is an overt tension here with respect to the Confederacy and the amount of respect that some people think it should receive, and it predates the Trump Administration and the horrible events in Charlottesville. 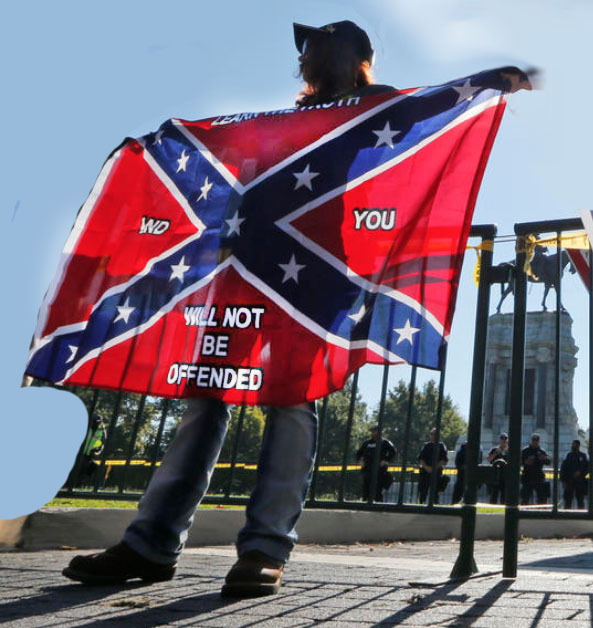 The Flaggers (yes, they call themselves that) organized in 2011 in response to the Virginia Museum of Fine Arts’ (VMFA) decision to remove a Confederate battle flag from the front of the Confederate Memorial Chapel. At one point in its history, this building was part of a home for Confederate veterans. These days, the chapel is part of the property owned and operated by the VMFA, which can do anything it wants to with the chapel. And that seems to include refusing to fly the Confederate battle flag in perpetuity. That’s the VMFA’s right as a property owner, but the Flaggers were pretty unhappy about it. In 2012, the Flaggers became outraged at other Richmond-area museums. The group protested the opening of the Museum of the Confederacy’s new branch at Appomattox because it refused to fly the Confederate battle flag outside of the building. (There’s that dang battle flag again! Always appearing when there is trouble.) The Flaggers apparently weren’t placated by the fact that this museum preserves and exhibits one of the largest collection of wartime flags-but these flags are indoors, so obviously that doesn’t do anyone any good. The Flaggers contend the Confederate battle flag should be celebrated, along with the men who fought under it (and against the United States). The Flaggers’ interpretation of the Civil War aligns with the “Lost Cause” narrative, which is a fascinating rewriting of history. This narrative proclaims that slavery did not cause the Civil War, the Confederacy fought solely for “states’ rights,” relations between white and African American Southerners were peaceful before the war (ha! ), and that African Americans supported the cause in large numbers (double ha!). Fun fact: The VMFA is located across the street from a women’s clinic. Nearly every Saturday, anti-choice protesters annoy clinic escorts and patients on one side of Grove Avenue and Flaggers annoy people on the other side of Grove Avenue. If you’re standing on the corner of Grove and Boulevard and you hear a horn honk or see someone toss up a middle finger, you can’t be entirely sure which party is being targeted-the anti-choicers, the brave people engaging in clinic defense, or some people apparently upset that a museum refuses to fly a battle flag used by a “nation” that hasn’t existed for over 150 years. Sometimes walking around Richmond is a surreal and fascinating experience. So, Richmond, like a lot of Southern cities, has a contingent of residents who like to proclaim, “History, not hate!” The rest of us really wonder if that’s the case. The more charitable part of my personality wants to believe that some white people who say they want to value their “heritage” just don’t think about the ways in which the antebellum South was a hellish place for millions of people who were brought over on ships against their will and forced to do manual labor in the hot Southern summer sun. I think it might be possible for white people to think only of beautiful plantation mansions and gorgeous dresses that their great-grandmothers wore. I understand wanting to ignore the pain and suffering that slaves endured–it’s a history that is shameful. But to ignore it is to be willingly, and willfully, blind to what inspired the Confederacy States of America to form, and why those eleven states seceded from the United States of America. We owe it to those slaves to recognize them as people, and to be intellectually honest about how their suffering is intrinsically linked to the Civil War. Richmond has a firm place in Civil War and Confederate history. The city is lousy with monuments and landmarks that remind us about the 1860s. The city is also populated by people who disagree about what we should do with the monuments to Confederate soldiers. What will happen in Richmond in the long term? I have no idea. Hopefully no other cities will experience what Charlottesville did. Hopefully white people will be better at listening and learning about their privilege, and what that means in the larger context of American history. Hopefully America becomes less hateful as the exhausting Trump Administration continues to vex the majority of voters who did not elect Donald. Until recently, Leslie Ludgate taught college in Virginia. Illustration adapted from Steve Helber’s AP Photo.